Sheryl Sandberg, the Chief Operating Officer of Facebook, recently proposed that we ban the word “bossy.” Her reasoning? A little over a month ago, I posted a quote from Sandberg on my website’s Facebook page: “I want every little girl who is told she is bossy to be told she has leadership skills.” The post ignited a firestorm of commentary. However, my reasoning behind the post was for my daughters. I want them to grow up in a world that values their leadership skills, especially considering the level of time and effort I am investing in teaching them these skills. As a professor whose doctorate is in leadership studies, it was only a matter of time before I waded into the issue. In the four weeks that followed my post, and Sandberg’s movement to ban the word, the media backlash has been stunning. Most of this backlash states the same thing, that we should call bossiness for what it is, and leadership for what it is. I, for one, agree – with BOTH! In a day and age where we are mostly told to pick a side and that we have to lean one way or another, I propose a new definition of leadership, but one that clearly takes the best of both worlds, without compromising each other. Let me begin with Sandberg’s ideas. She wants to break down the barriers preventing women from having leadership roles, as well as to pave the way for women leaders of tomorrow, and rightfully so. According to catalyst.org, women comprise slightly less than 15 percent of the executive leadership of the Fortune 500, a number that has become stagnant and unchanging over the last four years. Women hold a mere 17% of the seats in both houses of Congress. 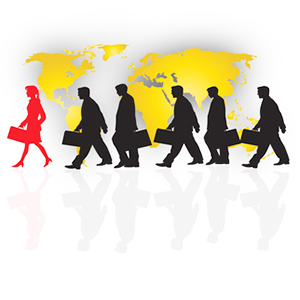 Throughout the U.S., men continue to hold 82% of leadership positions, across all sectors. This is the world in which we live, men and women alike, and it is the world from which Sandberg writes. There is clearly a problem somewhere, and I don’t fault Sandberg one bit for trying to do something about it. Perhaps she’s right, at least, to an extent. She cites research that states, between elementary school and high school, girls’ self-esteem drops an average of 3.5 times more than boys’ self-esteem. Being the father of one teenage girl and one preteen girl, I can vouch for this, on a gut level. Is it because young girls are taught that being assertive is “bossy” or inappropriate behavior for a young lady? When we take a look at the b-word that “bossy” is eventually replaced with once girls become women, we can intuitively see this phenomenon for ourselves being evident in b-words that are both used for the same purpose. However, we also need to look at the other side of the argument. There are times when bossy means bossy, whether for a boy or a girl. There are certainly times when authoritative crosses the line into authoritarian, and a child, regardless of gender, needs to be taught the art of leadership. Looking deeper into this point, we can see that “banning bossy” could create myriad problems for future generations. This is where I propose a new conception of leadership. The English language, as most of us know, borrows words from many other cultures, and from these cultures, there are many choices we could use to describe leadership. We could use the French “chief,” meaning the ruler or head of something. We could use the Dutch “baas,” meaning master. We could use the Italian “maneggiare,” meaning to control. Instead, we use the Old English word, leader, which is derived from “laedan” meaning, to guide. Why guide? Deep down in our hearts, we know that to lead is to guide, which implies a symbiotic, side-by-side, mutual relationship in which leader and follower benefit equally. To equate qualities like “bossiness” or assertiveness with being the hallmark of great leaders is a categorical mistake, and this is where I think Sandberg gets it wrong. If a boy or a girl is acting in accordance with words like chief, boss, or manager, trying to suppress others’ opinions and make decisions in a vacuum, decisions that affect everyone without their input — AKA, bossy — then they should be corrected. After all, do we want to raise a future generation of managers by allowing such behavior to continue unchecked? Or, would we rather raise a generation of leaders by teaching them to know the difference? Sandberg’s heart is in the right place, and although her critics are now trying to silence her, what they need to realize is the value in what she is trying to accomplish. To raise up a generation of leaders, we cannot continue defining leadership solely from a traditionally male perspective. We need to embrace a new definition of leadership that combines the best of all possible worlds. Activities, tasks, objectives, goals, initiative, time & stress management, etc. These criteria are what we consider to be task-oriented, and are easily quantified, which coincides with the positivist movement of the Industrial Revolution. This movement was sparked by thinkers such as Max Weber and Henri Fayol, people who saw humans as cogs in a machine and eventually started treating them as such. This movement was responsible for much of the stark, emotionless landscape of the American workplace that existed for many generations beyond the industrial era. These criteria are also inherently associated with masculinity, which should come as no surprise, because when the idea of performance reviews first emerged, the workplace was dominated by men, so the measure of success was set up by men, for men. As women began flooding the workplace, these women quickly learned that, what would help them succeed was to reprogram themselves to live up to inherently male standards. This was a benign practice five decades ago, but today, with more than half of our workforce comprised of women, is profoundly wrong. Patience – The greatest leaders do not need it all, nor do they need it now. They are visionary and willing to invest time and energy to achieve a long-term set of goals. Unlike the assessment criteria for leaders from last century, these are not easily quantified. There are no reliable assessments to assign numerical values to these qualities, so how can we recognize when somebody exhibits leadership as defined by this new perspective? The answer to this is simple. We need not quantify everything. For the quantifiable, traditionally masculine characteristics of leadership, let’s run a report and assess it. But that must not be the end of the leader’s assessment. For the abstract, relationally based characteristics of leadership that we need to promote as beneficial, let us be more observant and take note. While these qualities are not necessarily measurable, they are most definitely felt, so when someone exhibits these qualities, let us nurture them, let us promote them, and most importantly, let us encourage them in all aspects of the new leadership. Qualities of leadership can no longer continue to be gendered as feminine vs. masculine. These are now necessary to balance leadership. More importantly, these qualities, when taken together as a whole, are needed to take leadership from being a managerial conception to that which more closely resembles the guidance from which leadership derives its namesake. To Sandberg and her critics: I will be raising my children as leaders, but not according to a narrow, traditional view of leadership. The problem this leadership professor has with “Ban Bossy” is not the view of leadership where girls are called bossy whenever they assert themselves. The problem I have is with the view of leadership where boys who are bossy are used to define what it means to lead. My children—both sons and daughters—will be raised with balance, knowing how to temper ambition & drive with compassion, and when to pause to listen to others for the good of the group, rather than push forward for their own sake. Thank you for sharing and explaning why leadersip is still such a male dominated phonomenon today worldwide. An inclusive leadership starts with the next generation, not just in the family but in schools as well as you have correctly pointed how the self esteem of girls sees a significant drop right up to teenage years.